Researchers and practitioners of adaptive hypermedia, Web personalization and user modeling, have identified various characteristics of users that present a considerable effect when coupled with the technology, for adapting and personalizing content and functionality of interactive systems within specific domains and contexts of use. As these factors have shown to influence certain research directions and practical domains (e.g., modeling interests in recommender systems, or modeling knowledge in educational hypermedia systems), more intrinsic human traits and abilities (attributes that define each person as an individual, e.g., cognition, emotions, personality) and their respective values may also have an important role in fields, areas and computer-mediated environments that entail human-computer interactions. Bearing in mind that such human-computer interactions are primarily processed on a cognitive level, e.g., users are required to process and comprehend information, learn, solve problems and take decisions, it is of critical importance to investigate and integrate individual differences in the visual and interaction design and development process of current practices. Whether integrated in the user modeling construction process or intelligently incorporated to generate smart user interfaces, it is expected that the benefits will significantly increase the usability, user experience and quality of systems. Apparently, modeling individual traits and personalizing content and functionality of interactive systems is a challenging endeavor given on the one hand the multi-dimensional and complex nature of human factors and on the other hand the heterogeneous data structures and content meta-characteristics. So far, such individual differences have been widely studied and applied in personalization systems but with mixed yielded outcomes, which could be the result of the endogenous multidisciplinary character of the research works or the nature of the reported studies. Thus, modeling intrinsic human factors and incorporating these in adaptation and personalization systems still remains an open and challenging issue, and further studies and approaches are yet to be found. In this respect, in HAAPIE 2016 we encourage original and relevant contributions focusing on experiences and lessons learned from real-life applications, current state-of-the-art methodologies, challenges tackled and solutions adopted, tools and services in the academic, public or private sector, studies, theories, techniques, and evaluation approaches that could support human-centered adaptation and personalization issues in various levels of interactive environments. 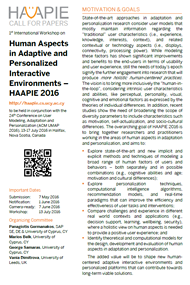 HAAPIE 2016 will be a full-day workshop at the ACM Conference on User Modeling, Adaptation and Personalization (UMAP 2016). The event will be small and specialized on interdisciplinary sessions as a set of oral presentations, and round-the-table (panel) discussions led by key invited persons related to the main theme of the workshop. The workshop will start with a keynote speech of an invited researcher and will consist of technical papers, their commentaries, and a short discussion on the topic of papers. At the end of the day there will be a summary of outcomes and goals for the next such event. This workshop focuses both in academia and industry and aims to attract the attention of an interdisciplinary audience between researchers and professionals working in the field of Web Adaptation and Personalization, User Modeling, Human Factors, User Experience, and User-centered Tools and Services. It will bring together scientists, students, human factors’ professionals, ICT professionals, service providers and developers, product designers, and general users to exchange and share their experiences, new ideas and research results about all aspects (theory, applications and tools) of bringing human factors into the adaptation and personalization process. They will discuss the practical challenges encountered and solutions adopted on content and services, the personalization of the Web structures and hypermedia applications, as well as techniques that ensure the development of intelligent user interfaces in the best qualitative manner for the user.